As specialist or executive in an industrial enterprise you want to be accurately informed about your production processes at any time. The information available to you is the basis for each of your decisions and its quality directly affects your companies success. 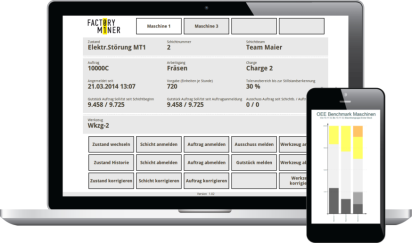 Thus, FACTORYMINER helps you to make your production processes transparent. Because only transparent processes can be specifically controlled and optimized. With its features FACTORYMINER acts as a link between management level applications (ERP, PPS) and the shop floor. Data can either be gathered manually (Production Data Collection) or automatically (Machine Data Acquisition). Due to its flexible interfaces FACTORYMINER is able to bidirectionally communicate with existing systems (e.g. ERP, PPS). It also can be connected with almost any machine. A wide range of reports and analysis as well as the current job progress and the precise tracking of all production steps is available to you anytime and anywhere—and all that absolutely device independent and in real time. feedback for planning systems etc. Subscribing our service is the most convenient and most cost effective way to use our MES software. The software runs in our data center in Austria and can be accessed from anywhere in the world by simply using an internet browser. The hardware for the production and machine data acquisition is constantly monitored and maintained. There is no need for you to invest in additional servers (hardware and software), or the monitoring, maintenance, or administration of software and hardware respectively. Protecting your data is especially important to us. Therefore, we always keep our cloud environment on the latest state of technology. We use modern cryptographic encryption methods on all system levels. Your data is encrypted before being transmitted from the browser to our servers. There it is stored anonymized. Furthermore, your data is backed up regularly and the backups are kept physically separated from our data center. The software is immediately ready to use. You don’t have to invest in IT equipment or infrastructure. You don’t need any IT-expertise or own IT-resources. We do all the operation, maintenace and administration. Your data is protected according to the latest security standards. Your data is backed up regularly. Our software is optimized for scalability and grows with your needs. integrated webservice interfaces for data exchange with ERP, PPS, PLM systems etc.